We're on another one of my (should have been a) shortcuts. Exiting CA-99 at Union Avenue, we turned due north and cruised on through Farmland, USA. Eventually we'd reach CA-178, but not before driving slowly through the unusual town of Greenfield. This town was straight from a David Lynch flick...downright creepy! 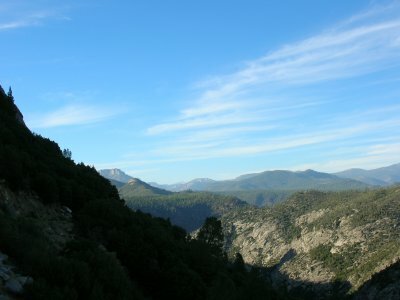 Our plan today is to add the last segment to a grand loop in the southern Sierra Nevada, the completion of a ride I attempted in May, but was denied by deep snow. This final segment is the climb from Windy Gap at 7400' over 9300' Slate Mountain, with the trail bypassing the summit and topping out at just over 9000' on the northwest ridge. The trailhead is behind us. It's 10:30 AM, and already hot on the sparsely forested climb up from Camp Whitset. The road is in great shape, and at 5200' we're not yet feeling the altitude. We cross a bridge over Nobe Young Creek, and there is almost no water. Normally, this spot is a roaring cascade, now just a trickle. Differing styles... Sean is riding slow and steady, wisely saving his beans for later. I'm trying to keep a pace optimal for my crappy gears, and riding too fast to last. We top a rise and are grateful to be up in the meadows, out of the heat and on the flats. The weather up here is freakin' perfect! The slight breeze carries a heavy opiate of baked pine and willow, dulling the lingering pain from the climb, making us forget about the 3000' of climbing to come. The highway stint is almost exactly one mile, gently climbing then leveling off for a quick rest. A left turn onto the Crawford Road marks the start of the second climbing stage. We pass by Nobe Young Meadow and begin a long switchback leading up to Windy Gap. There is a strange sound far off up the road...sounds like a motorcycle fighting with lawn furniture. "All hail the Hypnotoad!" As we near Windy Gap, we see the source of the commotion. The Forest Service is doing brush work along the side of the road, and have a mammoth wood chipper. Fortunately they are taking a break by this time, sparing our ears the good vibrations. Just over the Gap we find the Summit Trail splitting to the north...uphill. The trail is pretty mellow, for about half a mile. Then we turn skyward and the lung-busting begins. Not long after the first steep pitches began, we were forced off the bikes by thickets of buckthorn and willow blocking the trail. We battled on through this relatively brief setback, but the grade remained steep. 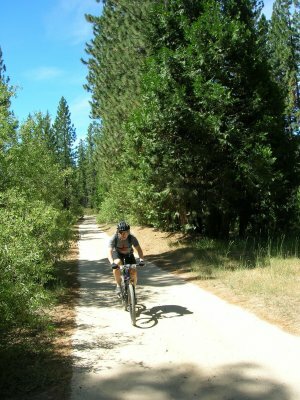 Imagine riding two laps on the Lower Sam Merrill Trail, except along with all the loose rocks you now also have huge acorns, fir and cedar sticks, pine cones, fallen trees up to 4' in diameter, uncompacted duff, sand, and a few more loose rocks. Now, add to that the fact that instead of starting at 1700' elevation, like Merrill, you start at 7400' elevation. And rather than ending at 3200' you top out at a whopping 9000' above the sea. In light of these difficulties, Sean played it smart and walked for much of the climb. I stubbornly tried to ride every section of trail I could, and was having a hard time of it. The terrain in the southern Sierra can be frustrating. 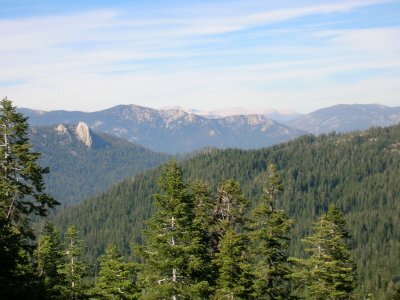 The slopes of mountains are generally less steep than in the San Gabriels, and hidden under a dense canopy of 200'-tall fir trees. Many false summits are achieved before you reach your goal. The switchbacks went on and on before we finally topped out on the south summit of Slate Mountain. The altimiter read 9060' and I surely believed it! We dipped down the ridge towards a saddle, heading northeast to the main summit of Slate Mountain, and losing 300' of hard-won elevation. But the trail conditions were improving greatly. We were now getting glimpses down to the west, past the Tule River drainage and on to the San Joaquin Valley. The vista smudged from green to brown to straw, softened by haze. We turned more or less north again where the southwest ridge abutted the summit mass. Undoing the loss of 300' was no mean task at this altitude. Eventually we reached the high point of the trail, at 9080' on the northwest ridge, where, allegedly, another trail drops to the northwest towards Camp Nelson. If such a trail existed, it would make for an epic descent! But, alas, we saw no evidence of such a path. We hung out and ate lunch, admiring the hazy view down into the flat, sun-baked core of California. The descending was pretty rough for the first mile or so, and Sean had a nasty wipeout, getting knocked into the rocks on the side of the trail. No bones were broken, and we were under way on what turned out to be some of the best riding on the loop. The trail became more buff as we neared Quaking Aspen campground, and we picked up speed. We came to a screeching halt at a tremendous overlook. We finished the Summit Trail on a fine note, finding cold water at Quaking Aspen campground. Across the highway a dirt road lead northeast to the start of the Freeman Creek Trail. This was the 'sugar' of the ride - a wonderfully buff trail swooping down through huge sequoias and old-growth fir and hemlock. The trail flattened out as we neared the Lloyd Meadow area, and we passed by the largest tree in this part of the forest...the George H W Bush Tree. Apparently, the ex-CIAmmander In Chief had a very out-of-character flash of green and deigned to preserve this grove of sequoias. There was a large granite 'headstone' with his name and a short blurb etched in sitting at the base of the tree. For a moment, we contemplated rolling the stone into the forest somewhere, but decided it would be a waste of energy. 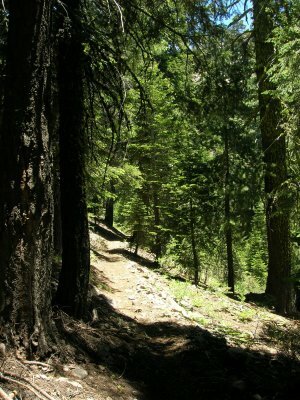 The trail tracked on through the forest and eventually hit the upper Kern River Road right near the Lloyd Meadow and Forks Of The Kern trailheads. We had a choice of adding in the 4-mile bonus singletrack that bent east towards the Kern River, or skipping the bonus and trudging mindlessly back on the road. Since the hour was late, and we both were pretty spent, the road was the choice. But Oh! what a road. We passed through a couple more small sequoia groves, and zipped past Merlin Dome, riding a broad catwalk above the inner gorge of the Kern River. 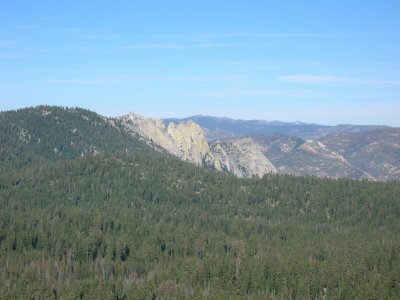 To the east, across the gorge, stood the huge western wall of the Kern Plateau. The rampart stretched 20 miles in either direction, with Sherman Pass almost directly east of us. The sun is setting, and we're now racing the darkness. There's a nice downhill beneath the immense spires and domes of The Needles, and we cruise ultra-fast down to Lower Peppermint Creek campground. Then a long, well-graded climb brings us over a saddle and into the next little side-valley, where an even longer and faster downhill waits. Full speed, no brakes, pray ta gawd there ain't no trucks comin' the other way!